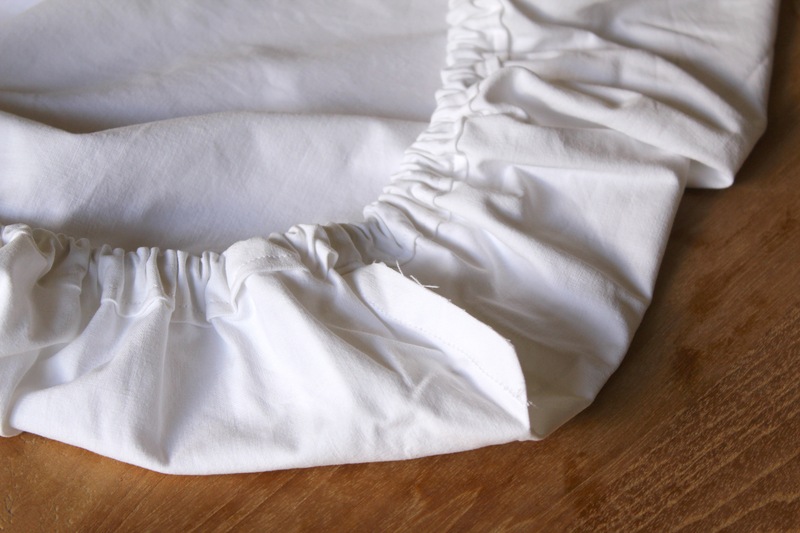 Upcycling – Making Bassinet and Cot Sheets | Hey Bernice! I recently introduced my mother-in-law to eBay…. she loved it! We went searching for a bassinet (with a little bit of character) for the baby. I really liked the older style cane bassinets, and eBay delivered (it also happened to be located about 30 minutes from my Mother-in-law’s house). We placed our highest bid a $50 – and won the auction! We were both over the moon. They were only selling the bassinet, on a stand with wheels – no mattress or sheets etc. So we then had to hunt down a mattress that would fit, and some sheets. My husband also gave it a freshen-up with a can of white spray paint (I wasn’t allowed to use the spray paint being pregnant. It was a miracle I was able to keep my nose out of that part of the transformation!). My mother in law sourced the mattress and protector, and one set of sheets. I decided to spend my ‘waiting’ time before the baby arrived making the other sheets (fitted and flat) for my newly acquired bassinet, and cot. Why make them when I can by them? I hadn’t seen any sheets I had liked, they were all too busy or too expensive for what you are buying! You can imagine my excitement when mum asked me if I wanted any of the beautiful, white, top quality, 100% cotton, single bed sheets she had in her cupboard. They were my grandmothers, and had been sitting in mum’s cupboard since she moved into a nursing home several years ago. 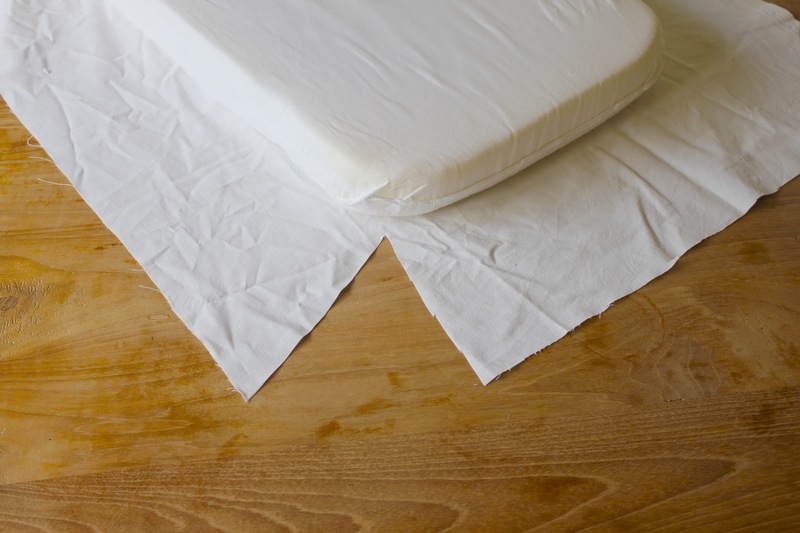 They were a really thick cotton sheet (great for soaking up baby vomit, wee and poo! ), and in excellent condition. Of course I said yes to her offer, and returned home with a bag full of material to transform into sheets. The sheets I was given were flat, single sheets. Each were finished properly (folded and sewn) on one of the short ends, and finished as part of the weave on the long edges. To minimise the amount of sewing I needed to do I made the most of this and used these finished edges where I could on 2 sides of my flat sheets. 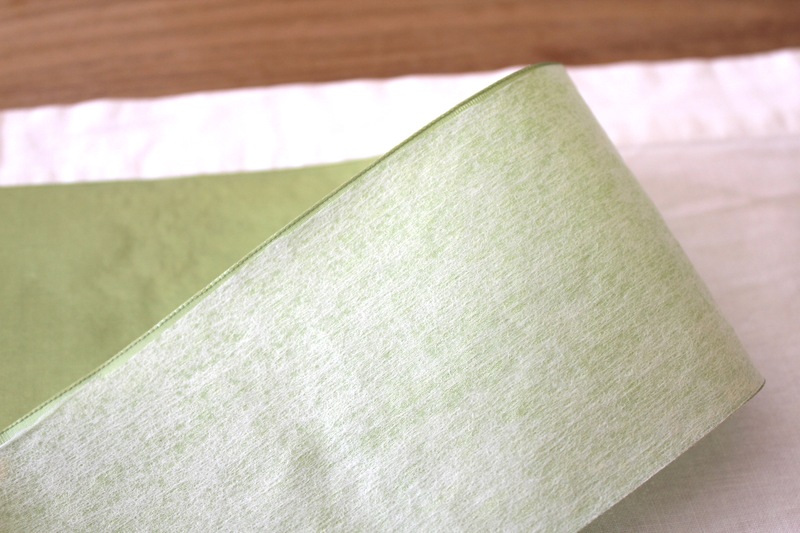 I used the folded and sewn end as my fold-over part of the sheet that would be at the baby’s head. Use one of your bassinet or cot sheets to determine the size you need to cut your material, leaving about 3cm to properly finish the edges on the 2 sides that you are cutting. 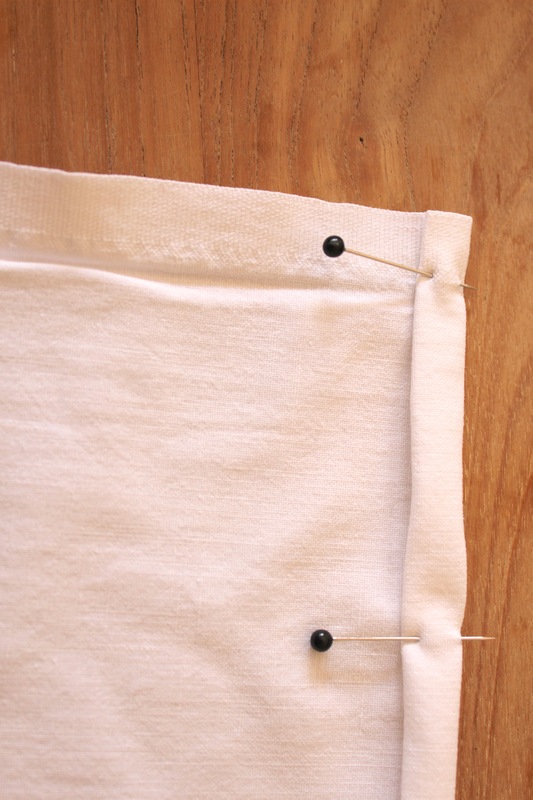 Once you have cut your sheet size, take some pins and pin the edges ready to sew. 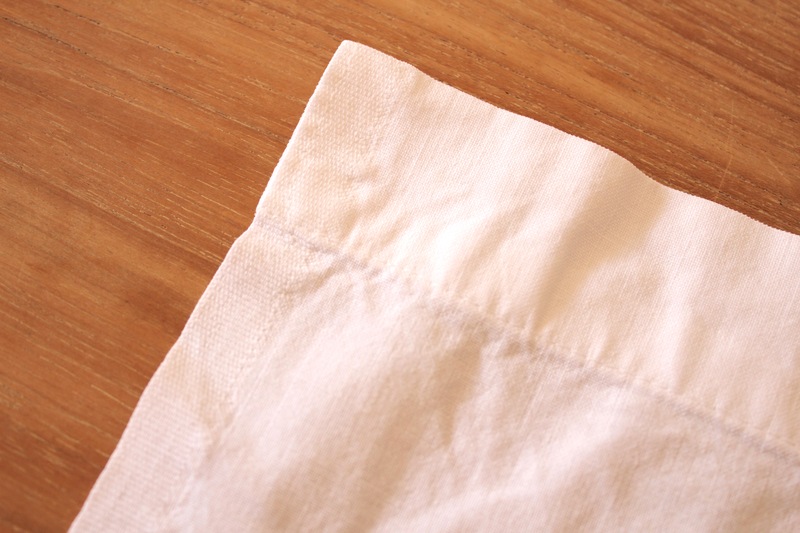 Make sure you fold over the edge about 1cm, then fold it over again – that way you don’t expose the raw edge of the material, and it won’t fray when you wash it – it also looks neater. Sew down both sides to finish your sheet. Note: Make sure that you fold both sheet edges over onto the ‘wrong’ side of the sheet – so you have a good side and bad side. Now for the decorative part. I have used two different materials to decorate my sheets – ribbon and material. The green, silk ribbon was from a roll mum found in her cupboard, it probably belonged to one of our grandparents. 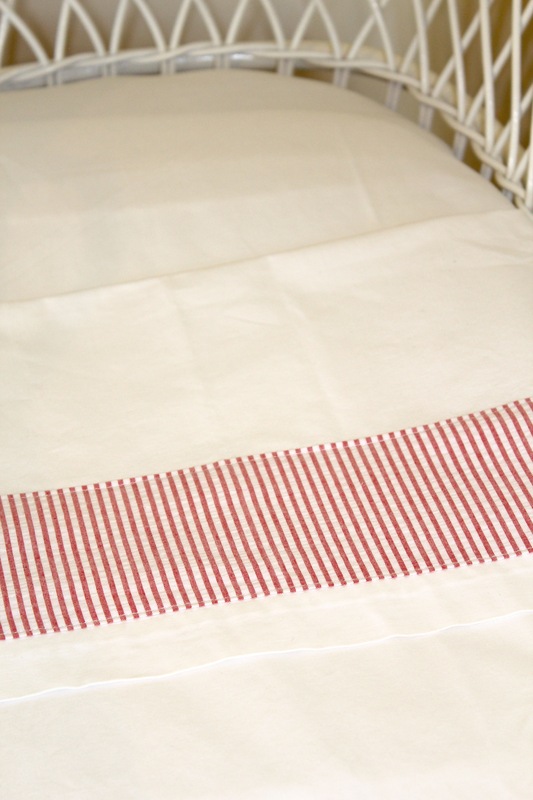 The red and white, cotton, striped, seersucker I bought. I ironed on some interfacing to the back of both materials to give them a little more structure, and help them hold their shape after washing. Cut the interfacing just slightly smaller than the material so it doesn’t hang over the edge. Pin the material/ribbon just below the folded and sewn edge that runs along the top end of the sheet, on the good side of the sheet (where the baby’s head will be), allowing some sheet to be seen, and sew into place using cotton of a similar colour to the material (I used green for the ribbon, and white for the red and white striped material). 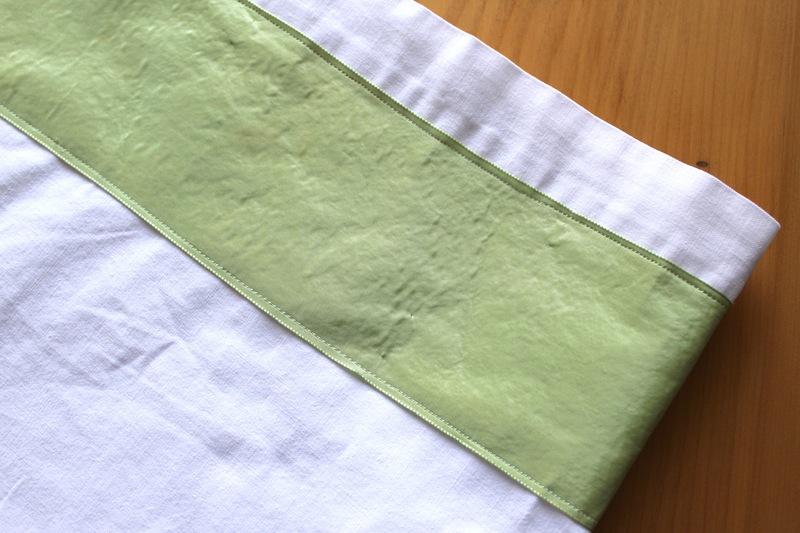 Note: When using material to decorate the sheet, use the iron to fold under the edge of the material about 1cm, so it is finished properly when you sew it onto the sheet. You will also need to do this for the ribbon at both ends (where you have cut it). 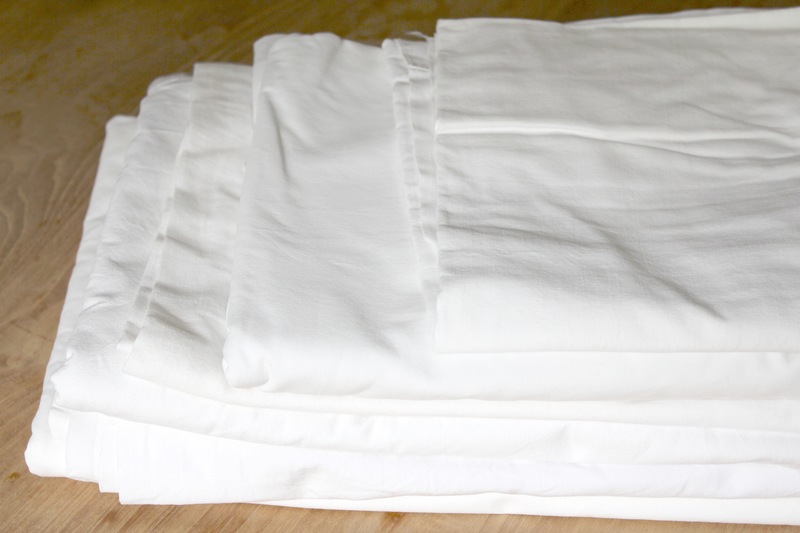 Take the fitted sheet you have bought and use it to gauge how much material you will need (by measuring it). If you haven’t bought one, then you will need to measure your mattress (Bassinet or Cot). Measure the basic dimensions down both sides, then the depth. You will need to mark onto the material the basic dimensions, then add on the depth of the mattress on each side… plus another 5cm to hem around it. If you want the sheet to fit better you can cut a triangle out of the material at each corner, then sew the cut edges together at each corner before you hem the material. The sheet will then fit more snugly around each corner of the mattress. However, if you want to keep it simple, you don’t need to take in the corners for a better fit. Simply round off the edges (with scissors), and hem around the material. To hem it, fold over the material once (about 2cm) then again. You want to allow enough room in the hem to thread a piece of elastic. 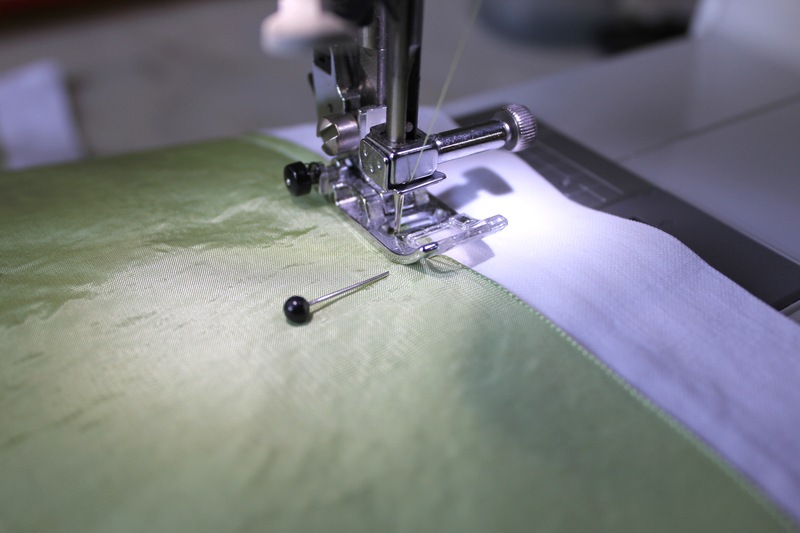 Note: Make sure you leave a gap when you are hemming the sheet, as you will need to be able to feed your elastic around the edge of the sheet, within the tube you have created. 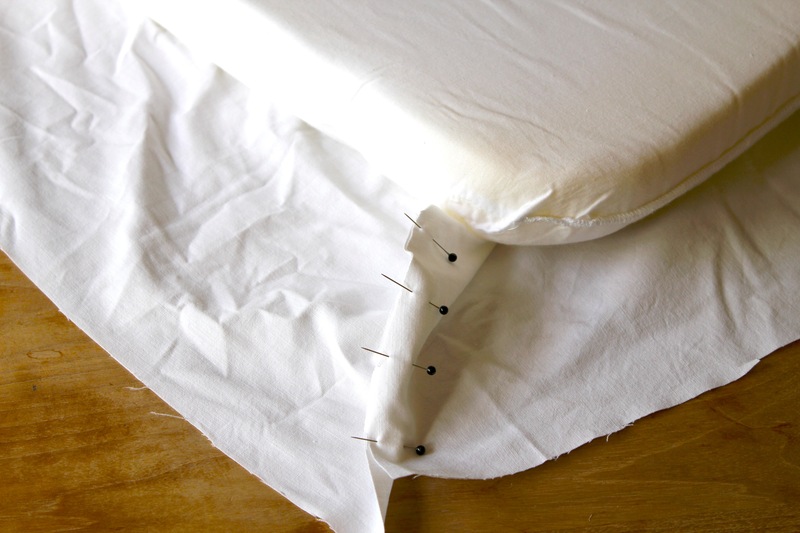 To thread the elastic around the sheet you will need a safety pin. Attach the safety pin to the end of the elastic (tip: fold the elastic over so it is doubled up when you attach the pin, otherwise it will fray as you are threading, and the pin will separate from the elastic – speaking from experience!). Slowly feed the safety pin around the edge of the sheet (through the tube you created when hemming the sheet), allowing the elastic to feed through with it. Note: Make sure you hold onto the end of the elastic, ensuring it doesn’t disappear into the tube while you are feeding it through. 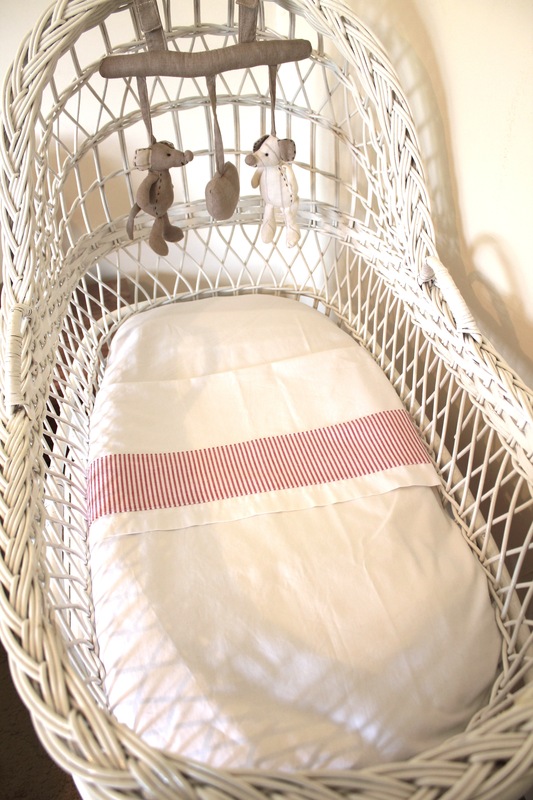 There you have it – Up-cycled bassinet and cot sheets. Doing your bit for the environment, and saving yourself some money at the same time. Beautiful! Just needs a nice blanket to finish it off now! Maybe one will be in the post this week… 🙂 Lucky baby! Gorgeous. Can’t wait for photos of him/her (I’m tipping it’s Bernard) snuggled under.